In this online program, you will master basic and advanced AutoCAD design skills as you gain hands-on practice using the 2D tools in AutoCAD 2018. You will begin with learning the basic tools for creating 2D drawings. You will annotate the 2D drawing by adding text, hatching, tables, and dimensions. To further this knowledge, you will explore AutoCAD tools such as blocks, layouts, templates, annotation styles, and sheet sets, to help improve your efficiency with the software. After completing the course, you will have also covered many advanced concepts including the use of external references and image files, collaboration tools, publishing, and customizations. Once proficient with the 2D commands in the AutoCAD software you will be introduced to the concepts and methods of 3D modeling. 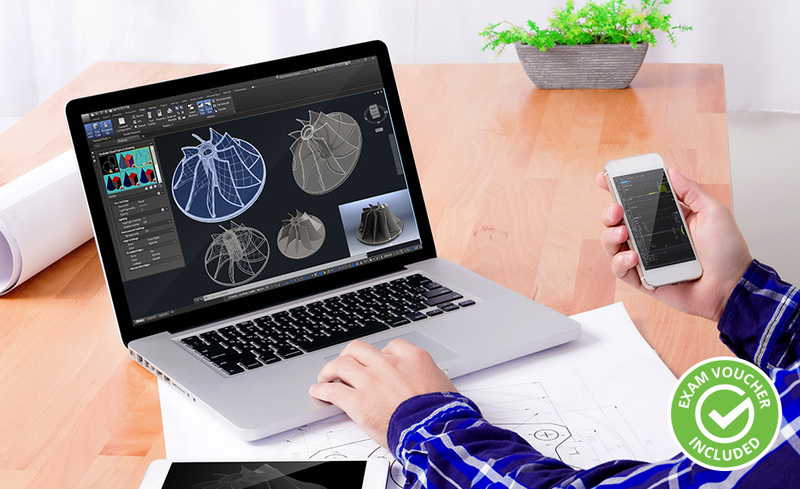 You will gain a thorough grounding in the fundamentals of 3D and explore the main features of the advanced 3D modeling workspace. This course uses Autodesk certified curriculum give you all the skills you need to prepare for the Autodesk AutoCAD 2018 Certified User exam. Your career is anything but flat. As you develop your design skills, you’ll open new doors in architecture, interior design, engineering, and a number of other design-related fields where your creativity will set you apart. The AutoCAD with AutoCAD 3D 2018 course is perfect for laying a strong drafting foundation and taking your expertise to the next level. This course provides you access to both a 2D and 3D training. You will also learn the AutoCAD functionality that’s required for the Autodesk AutoCAD 2018 Certified User exam. Starting with the AutoCAD 2018 training course, you’ll master the basic tools for creating and editing a simple drawing, and then you’ll learn how to use more advanced tools to craft and present your ideas in 3D. This course provides a thorough grounding in the latest fundamentals of 3D drafting and explores the advanced 3D modeling workspace. Once you master the basic 2D skills, you’ll move on to explore more advanced efficiency tools and complex objects. You’ll also start using external reference and image files, collaboration tools, publishing, and enhancing productivity with simple customization. You’ll gain valuable experience with hands-on exercises with the latest AutoCAD software as well as downloaded files to learn and practice your new skills. All examples and exercises are taken from the many professional fields in which AutoCAD is used. Upon registering, you are given nine months to complete the program. As a student you can also download a free version of the AutoCAD 2018 software that provides a 3 year student version license. Please note that ed2go cannot extend the software license for AutoCAD 2018. The AutoCAD 2018 student software license cannot be used in a commercial environment. Once you have completed the AutoCAD 2018 portion of the Online Training Program you will have learned the AutoCAD functionality that is required for the Autodesk AutoCAD 2018 Certified User exam. Proctor fees may apply, which are not included.